We all know change is no longer always sufficient – disruption and transformation are new key words. The major enabler is digitalization, as most Senior Executives and others know. However, in the Knowledge Society, we need everyone on-board; private sector, public sector, politicians, diplomats and others. 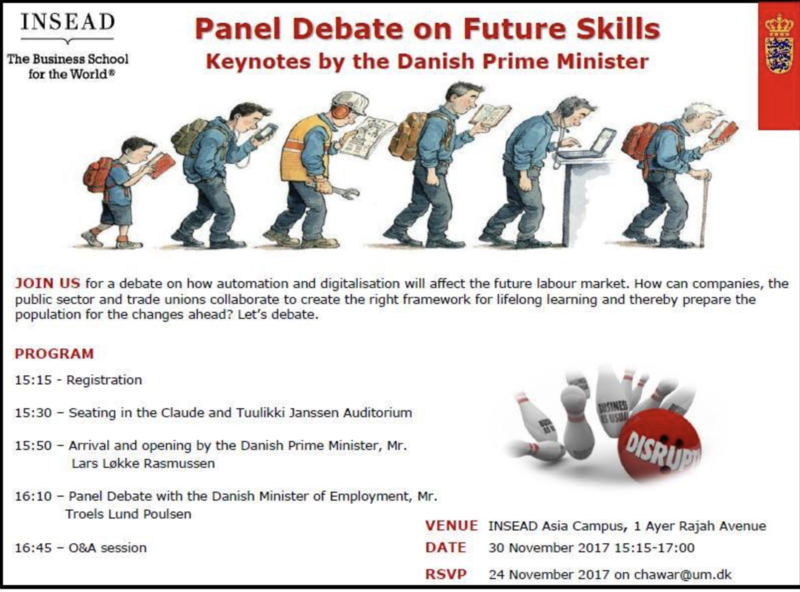 I am very pleased when Ministers – like Lars Løkke Rasmussen, Denmarks Prime Minister and Troels Lund Poulsen, Minister for Employment allocate time during a short official visit to Singapore allocate precious time on 30th Nov to visit the leading Business School INSEAD and to meet IB students to talk about “Lifelong Learning”. I sense Ambassador Dorte Vizardand team have contributed – and this is exactly what we should encourage. Lifelong Learning – and Employability, this is the way forward.